Whether you are on a gap year, summer placement or career break, if you want to get your hands dirty and see physical results from your placement overseas, our Community Building Project may suit you. Following the success of our building project in the Akuapem Hills we now also run a second building project in Cape Coast. Volunteers join one of these two projects and are either based in Kwamoso in the Akuapem Hills, just over an hour north of Accra or in a small village near Cape Coast, three hours west of Accra. Which ever location you work in you will join a team of Projects Abroad volunteers and local people constructing simple buildings in the local communities. Within many areas of Ghana thousands of families live in inadequate accommodation and children go to school in crumbling buildings. Our building project allows them to move to new, better-quality homes and for children to receive an education in secure, new classrooms. The buildings are usually made from mud bricks that are produced using a press, some mud and water, then left to set hard in the sun. 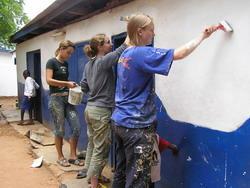 Volunteers help with this process and also with building the walls, plastering and painting the houses and schools. Each house takes an average of one month to construct. In addition to the basic project, you may also help with landscaping the surrounding area, painting local schools and renovating classrooms in schools already built. 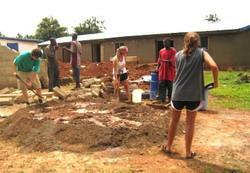 Volunteers even built a library for Kwamoso village school. By working with local people who will ultimately benefit from the buildings, this is a great opportunity to get involved in a rural project and become an integral part of an African community. Our full-time regional coordinators live nearby and visit the placements regularly so you'll always have full support from Projects Abroad too. Building work takes place early in the morning and late in the afternoon to avoid the hot midday sun, so you'll have plenty of time to get involved in Ghanaian life. Many volunteers get involved within the local community by helping in the kindergarten class, or playing football with some of the school children once the building work has finished for the day. "Yes the volunteers provide welcome helping hands on the building site; enabling the projects to reach completion before the rains come and wash any unfinished structures away, but the projects would not be possible in the first place without the money coming from volunteers' fees through Projects Abroad. These not only help to supply tools and materials to the building site but extend beyond the building site into the communities we are placed in. For a rural family, reliant on agriculture and market forces to make a living, a steady income from taking a volunteer into their home can also make a real difference to their lives, as can the seemingly small amounts of money the volunteers themselves bring with them and spend in the community."